Impressively directed, superbly acted and emotionally engaging, this is a thought-provoking drama that practically screams Oscar. Based on the semi-autobiographical novel by Bernard Schlink, The Reader opens in 1995 Berlin, where lonely lawyer Michael Berg (Ralph Fiennes) is haunted by his past. He thinks back to the summer of 1958, when, as a 15-year-old boy (played by David Kross) he had a passionate affair with 36-year-old Hanna Schmitz (Kate Winslet), during which he would read to her from a wide range of books. When Hanna abruptly disappears, Michael is distraught, but that's nothing to how he feels eight years later, when he's observing the Nazi war trials as a law student and discovers that Hanna is on trial for her actions as an Auschwitz guard. As the trial continues, Michael realises that Hanna is illiterate, which has crucial implications for her case. With its Academy-friendly themes of illiteracy and the Holocaust, you could be forgiven for thinking that The Reader was cynically written with the Oscars in mind. However, rather than indulge in melodrama, the script presents a powerful examination of post-war guilt, morality and the weight of history. 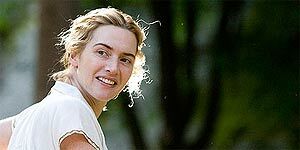 Kate Winslet convincingly nails the German accent and delivers a powerful, yet enigmatic performance that will almost certainly net her an Oscar nomination - her Oscar clip is almost certain to be the bit where she teaches herself to read ("The! "), not least because it's one of the only scenes where she's actually got her clothes on. There's also strong support from David Kross, who perfectly captures the thrill, heartache and confusion of first love; the film is as much a coming-of-age story as anything else. Reuniting with David Hare (his screenwriter for The Hours), director Stephen Daldry orchestrates several terrific scenes and does an impressive job of conveying three distinctly different periods, while building to a powerfully emotional finale. In short, The Reader is an emotionally engaging, powerfully provocative film with an Oscar-worthy performance from Kate Winslet. Highly recommended.